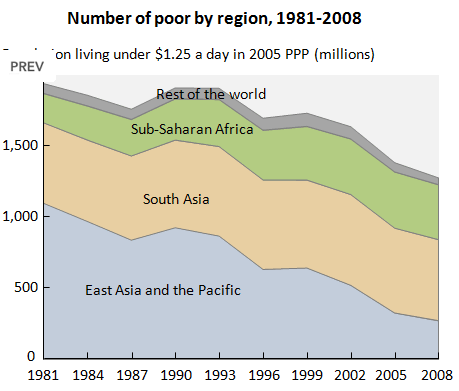 The World Bank has just announced that 22% of people live on less than $1.25 a day, down from 43% in 1990. That’s a big reduction, and as the Bank says the world is going to achieve its Millennium Development Goal target of cutting extreme poverty in half by 2015. But still, a lot of people are poor — 1.29 billion, to be precise. It’s the equivalent of over 1.5 times the entire population of Europe (including every woman, man and child) living on 78 British pence. The figures are even adjusted for the cost of living in each country (purchasing power parity). Most of the poverty reduction is down to economic growth in China and the rest of East Asia. If you exclude China the number living in poverty has hardly changed since 1981. Sub-Saharan Africa hasn’t done too brilliantly, and South Asia doesn’t appear to have managed to cut poverty at all. Given that China is the only major bloc left in the world not to have followed the free-market Washington Consensus, this isn’t a ringing endorsement of liberal economic policies. Latin America, South Asia and Africa have all undergone significant liberalisation over the period in question. Although China has too, its current state is still much more government-heavy than the others. But even with the current rate of progress, about one billion people would still live in extreme poverty in 2015. And the bunching up we see just above the $1.25-a-day line points to the continuing vulnerability of poor people across the world. The blue part of the graph below has actually got bigger over the last few decades although the absolute number living on less than $2 has fallen slightly. The Bank’s official international poverty line is $1.25 a day, the average of the poverty lines in the world’s poorest 10 to 20 countries. Each country has its own poverty line. 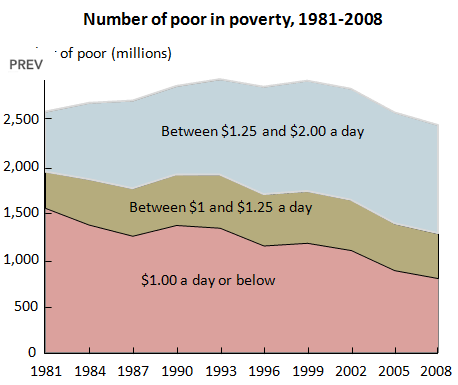 The Bank also looks at other levels, such as $2, which is the median poverty line for all developing countries.